The National Door to Door Company is the UK’s leader in leaflet distribution and direct marketing solutions. We offer an array of integrated services in addition to our core door to door leaflet delivery services. These include demographic targeting, door drop campaign strategies, consulting and various bespoke delivery options. There are over 28 million deliverable homes in the UK. 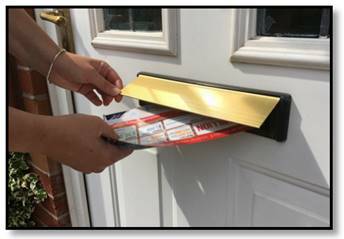 Therefore using leaflet distribution door drops you are able to put your message through the letterbox of the audience that you are targeting. With various distribution options available, including team shared distribution, solus distribution and Royal Mail distribution, the right method for your audience will be chosen. Furthermore, with quantities in the hundreds to quantities in the millions, there are options to suit all budgets. At d2dc our vast network and expertise throughout the UK focuses specifically on delivering your messages with precision and ease. Let our team help you build a solid leaflet distribution strategy which is the key to unlocking the potential in your marketing messages, therefore, producing the best return on investment for your business. Whether you are looking to either bring on new customers, talk to your existing customer base, or are looking to communicate a message to a local or national audience, targeted and cost effective leaflet distribution will help. Leaflet distribution is a very traditional way of marketing, however it is as strong as it’s ever been with 92% of people reading the leaflets that are delivered to their home. Leaflets are being kept in the home for an average of 38 days consequently maximising the effectiveness of your investment.